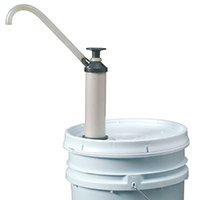 Plastic drum/pail pump dispenses up to 8 oz. increments. Chemical resistant, self priming, hand operated. Adapts to most pails and drums. Recommended for water-based liquids. Check out our other pumps! All contents © Stoner, Inc. 2011. All rights reserved.